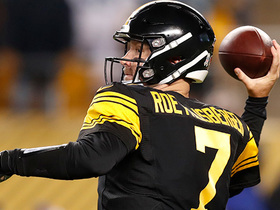 McDonald likely will take on an expanded role in the passing game after the Steelers parted ways with wide receiver Antonio Brown and tight end Jesse James, ESPN.com's Jeremy Fowler reports. McDonald caught three of his six targets for 39 yards during Sunday's 16-13 win over Cincinnati. McDonald caught one of his four targets for 49 yards in Sunday's 31-28 loss to the Saints. McDonald caught two of three targets for 13 yards and a touchdown during Sunday's 17-10 win over New England. McDonald brought in all four of his targets for 37 yards in the Steelers' 24-21 loss to the Raiders on Sunday. McDonald caught four of seven targets for 28 yards during Sunday's 33-30 loss to the Chargers. Analysis: Although he appeared to be fully recovered from the hip injury he sustained in Week 13 against Denver, McDonald had his third consecutive game with under 30 yards receiving. He'll look to bounce back against Oakland -- which allows the most fantasy points to tight ends per game (12) -- in Week 14. McDonald (hip) returned to a full practice Thursday. Analysis: McDonald is thus on track to suit up Sunday against the Chargers, and while the tight end hasn't been a volume play of late with 16 catches over his last five games, he has scored in two of his last three outings. He therefore profiles as a tight end option in deeper fantasy formats in Week 13. McDonald (hip) didn't practice Wednesday. Analysis: McDonald's status for Sunday's game against the Chargers is thus worth monitoring in the coming days. If he's out, or limited at all this weekend, added targets could be available for fellow tight end Jesse James. McDonald is dealing with a hip injury and may be limited at practice this week, Dale Lolley of DKPittsburghSports.com reports. Analysis: The injury didn't prevent him from handling his usual workload in Sunday's 24-17 loss to Denver, with McDonald catching three of five targets for 27 yards while logging 33 snaps on offense. One of the incomplete targets was a drop in the end zone, bringing an end to his two-game touchdown streak. Jesse James might be thrust into an every-down role if McDonald were to miss Sunday's game against the Chargers. McDonald caught three of five targets, accounting for 27 yards during Sunday's 24-17 loss to Denver. McDonald (hip) reentered Sunday's game at Denver. Analysis: McDonald will look to build upon three catches (on five targets) for 27 yards with an entire quarter remaining. His primary competitors for TE reps are Jesse James and Xavier Grimble. McDonald was forced out of Sunday's game against the Broncos with a hip injury. Analysis: Prior to his exit, McDonald had caught three of his five targets for 27 yards. In his absence, Jesse James and Xavier Grimble will handle the Steelers' tight end duties. McDonald caught three of six targets for 27 yards and a touchdown in Sunday's 20-16 win over Jacksonville. Analysis: McDonald scored the second of Pittsburgh's three unanswered touchdowns courtesy of an 11-yard grab. The tight end has gotten the ball over the goal line in two straight weeks, raising his season touchdown total to three. McDonald will look to extend that streak against the Broncos in Week 12. McDonald caught all four of his targets for 44 yards and a touchdown during Thursday's 52-21 win over Carolina. McDonald caught three of six targets for 25 yards during Sunday's 23-16 win over Baltimore. Analysis: McDonald saw twice as many targets as teammate Jesse James but wasn't able to do much with them for his second-lowest yardage total in a game this season. He has not reached paydirt since Week 2 but faces the Panthers -- who have allowed the most touchdowns to opposing tight ends this season -- Thursday in Week 10. McDonald caught all three of his targets for 47 yards during Sunday's 33-18 win over Cleveland. Analysis: McDonald seems to have emerged as the primary tight end target in Pittsburgh's offense. Over the past five games, he has caught 20 of 22 targets for 295 yards but has just one touchdown to show for it. In Week 9, he faces a Baltimore defense against which he caught all five of his targets for 62 yards in a 26-14 loss earlier this season. McDonald caught seven of eight targets for 68 yards in Sunday's 28-21 win over the Bengals. Analysis: McDonald was a force in this one, using his big frame to gain extra yards on almost every catch. He's emerging as the go-to tight end in Pittsburgh despite Jesse James' hot start to the season. Pittsburgh will be on bye in Week 7. McDonald caught one of his two targets for six yards during Sunday's 41-17 win over the Falcons. Analysis: Thirteen of Ben Roethlisberger's 29 passes went to Antonio Brown, and the remaining 16 were spread out among seven different players, limiting everyone's fantasy production. McDonald may not fare much better in Week 6 against Cincinnati, who has limited him to three catches for 47 yards in two career matchups. McDonald caught all five of his targets for 62 yards with a fumble during Sunday's 26-14 loss to the Ravens. 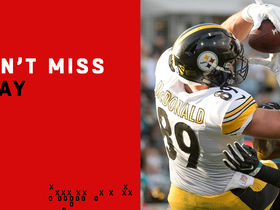 Analysis: McDonald has now had back-to-back solid efforts and tied Antonio Brown for the team lead in receiving yards. With the running game stalled the past few weeks, his physical play has been a boost to the offense, and it appears he has a firm hold on the starting tight end job over Jesse James. McDonald faces the Falcons in Week 5. McDonald caught four of five passes for 112 yards and a touchdown in Monday's 30-27 win over the Buccaneers. McDonald recorded three receptions for 26 yards across 37 offensive reps in Sunday's loss to the Chiefs. Analysis: McDonald split time with Jesse James throughout the contest, bringing in three of his five targets. However, it was McDonald's first game back from foot injury, so there is a possibility he could see a heavier workload Monday against the Buccaneers. McDonald (foot) is active for Sunday's game against the Chiefs, Dale Lolley of DKPittsburghSports.com. Analysis: After sitting out the Week 1 tie with the Browns, McDonald proved his health by practicing fully Wednesday through Friday. Though he'll suit up Sunday, it's uncertain how prominently McDonald will be featured in the Steelers' passing attack in his first game back from the injury. It's expected that some sort of timeshare at tight end between McDonald and Jesse James will be in place for at least this week. McDonald (foot) remains questionable for Sunday's game against the Chiefs, but he's expected to play in the Week 2 matchup, Ian Rapoport of NFL Network reports. McDonald (foot) practiced fully all week, but is listed as questionable for Sunday's game against the Chiefs, Teresa Varley of the Steelers' official site reports. Analysis: McDonald missed last week's game against the Browns, but his full practice participation this week suggests that he has a solid shot to make his season debut Sunday. Once it's clear he's up to speed, McDonald could offer some fantasy upside, but with fellow tight end Jesse James around and healthy, a wait-and-see approach is probably in order with McDonald in Week 2. McDonald (foot) was a full participant at Wednesday's practice. McDonald (foot) won't play Sunday against the Browns, Jeremy Fowler of ESPN.com reports. Analysis: McDonald practiced in a limited fashion Wednesday, offering hope with regard to his Week 1 status. A subsequent absence Thursday then turned into news Friday that the tight end won't play this weekend. In his absence, Jesse James will start and see added opportunities in Sunday's season opener. McDonald (foot) did not practice Thursday, Teresa Varley of the Steelers' official site reports. Analysis: McDonald practiced in a limited fashion Wednesday, so the Thursday downgrade clouds the tight end's Week 1 status. McDonald considers himself day-to-day, but if he can't play Sunday against the Browns, added opportunities would be on tap for Jesse James. 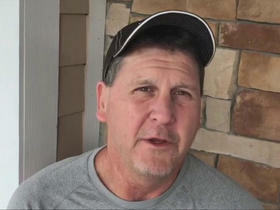 McDonald (foot) was a limited practice participant Wednesday, Scott Petrak of the Elyria Chronicle-Telegram reports. Analysis: This is McDonald's first reported participation of any kind since July 29, when he initially injured his foot. He'll probably need to log a full session before being cleared for game action, and the Steelers likely will ease him into action with a part-time role once he's ready. 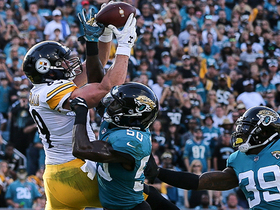 Jesse James is expected to get most of the snaps at tight end in the Steelers' Week 1 matchup with the Browns. McDonald (foot) is expected to practice in some capacity this week, the Pittsburgh Post-Gazette reports. Analysis: The tight end, who missed the past month with a foot injury, thus has a chance to suit up Sunday versus the Browns, though he'd likely need to practice fully at least once this week in order to get the green light for Week 1. McDonald (foot) is hopeful that he'll be able to play Week 1 at Cleveland, Jeremy Fowler of ESPN.com reports. McDonald (foot) sat out of team drills during Monday's practice, Mike Prisuta of the Steelers' official site reports. Steelers coach Mike Tomlin said Sunday that nothing has changed with McDonald (foot), Joe Rutter of The Pittsburgh Tribune-Review reports. McDonald (foot) is not practicing Saturday, Jeremy Folwer of ESPN reports. Analysis: McDonald, who didn't play in Thursday's preseason opener, has been nursing an unspecified foot injury for over a week now, and the tight end remains without a firm timeline to return to the field. McDonald (foot) will not play in Thursday's preseason game against the Eagles, Jacob Klinger of PennLive.com reports. Analysis: The 28-year-old hasn't practiced since July 29, when he first injured his foot. He's expected to challenge Jesse James for the top spot on the depth chart, but health has always been the biggest issue for McDonald, who is hoping to build on a 10-catch performance against Jacksonville in last year's playoffs. McDonald left Sunday's practice with a foot injury, Ray Fittipaldo of the Pittsburgh Post-Gazette reports. Analysis: The extent of McDonald's injury isn't clear, though there haven't been any reports that the tight end is dealing with anything severe. In any case, Xavier Grimble should temporarily see an increase in first-team reps alongside Jesse James, who is competing with McDonald for the No. 1 role. McDonald will be featured more in the Pittsburgh offense in 2018, Jeremy Fowler of ESPN.com reports. 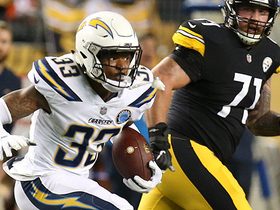 Analysis: McDonald played in 10 games during his first season with the Steelers in 2017, hauling in just 14 catches for 188 yards and a touchdown on the year. However, he showed out in the playoffs against Jacksonville, recording 10 catches for 112 yards in the game. McDonald has never been a consistent fantasy option at tight end, but he could be worth backup or spot start consideration in most formats if he sees an increased role as the top tight end with the Steelers. Steelers general manager Kevin Colbert expects McDonald to benefit from a full offseason with the team, Jeremy Fowler of ESPN.com reports. McDonald caught 10 of his team-high 16 targets for 112 yards in Sunday's 45-42 AFC divisional round loss to Jacksonville. Analysis: Where was this guy all season? McDonald never caught more than four passes or exceeded 52 yards in a game in his first Steelers campaign, yet he set new single-game career bests across the stat sheet Sunday. Considering that Jacksonville's defense had been stingy against opposing tight ends this season, McDonald's performance was particularly encouraging. Given his upside, he seems to have an edge over Jesse James for the role of primary pass-catching tight end heading into the offseason. McDonald, who caught one pass (on two targets) for five yards in Sunday's 28-24 win over the Browns, finishes up the 2017 season with 14 catches (on 24 targets) for 188 yards and one touchdown in 10 games. Analysis: McDonald missed several games this season due to injury, and didn't seem to hit his stride until Week 15. Splitting time with Jesse James, along with a diminished role for tight ends in the offensive game plan, resulted in McDonald's worst season since 2014. Pittsburgh signed him to a hefty contract that runs until 2022, so it is unlikely McDonald is going anywhere but, unless there is a change in how he is utilized, his fantasy value will continue to be limited. McDonald totaled 52 yards on four receptions in Monday's 34-6 win at Houston. Analysis: McDonald has now caught four passes for 52 yards in each of his last two games over the past three weeks. Plagued by minor injuries all season, he seems to be hitting his stride and has a favorable matchup in Week 17 against the Browns, who have yielded the second-most touchdowns (10) to opposing tight ends this season. McDonald (shoulder) practiced in full Thursday. McDonald (shoulder) has been ruled out for Sunday's game against the Patriots after not practicing all week. 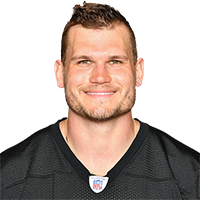 Analysis: The absence of McDonald ensures that fellow tight end Jesse James should be busy Sunday, but James will nonetheless be hard-pressed to approach his Week 14 production, after catching 10 of his 12 targets for 97 yards in the Steelers' 39-38 win over the Ravens -- a game that saw QB Ben Roethlisberger pass for 506 yards. McDonald (shoulder) did not practice Wednesday. 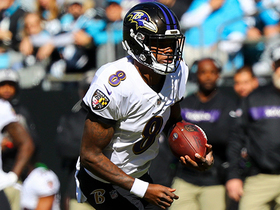 Analysis: McDonald hauled in four of his six targets in Sunday's 39-38 win over the Ravens, while logging 35 out of a possible 89 snaps on offense. That said, Jesse James was the more productive Pittsburgh TE in the shootout, catching 10 of his 12 targets for 97 yards, while seeing action on 71 snaps. As long as James is in the mix, McDonald is only worth a look in deeper fantasy formats heading into the Steelers' Week 15 game against the Patriots. McDonald caught 4-of-6 targets for 52 yards in Pittsburgh's 39-38 win over Baltimore on Sunday. Analysis: This was his best game since joining the Steelers, and the tandem of McDonald and Jesse James combined for 14 receptions and 149 yards against a Ravens' defense that had previously held opposing tight ends to an average of five catches for 47 yards per game. They face another difficult challenge in Week 15 against the Patriots, who they have not beat since 2011. McDonald (ankle) practiced fully Wednesday. Analysis: The full practice puts McDonald in line to play Sunday against the Ravens after the ankle injury sidelined him for each of the Steelers' past three games. Over his last three appearances, McDonald has averaged 30 offensive snaps per game, but he's mostly been deployed as a blocker rather than a go-to option for quarterback Ben Roethlisberger in the passing game. The Steelers have ruled out McDonald (ankle) for Monday's game against the Bengals, Ray Fittipaldo of the Pittsburgh Post-Gazette reports. Analysis: McDonald was unable to practice throughout the week, rendering the decision to keep him sidelined Monday unsurprising. The absence will mark his third straight while he continues to recover from an ankle injury. Xavier Grimble will presumably once again back up Jesse James at tight end as a result. McDonald (ankle) did not practice Thursday. Analysis: McDonald's absence from practice Thursday does not bode well for his chances of playing Monday night against the Bengals, though the tight end's outlook on that front could improve with a return to practice in some capacity by Saturday. Head coach Mike Tomlin said Tuesday that McDonald (ankle) "definitely will have a chance" to suit up Sunday at Cincinnati, Joe Rutter of TribLive.com reports. Analysis: Absent the past two games due to an ankle injury, McDonald will likely have to complete Week 13 prep without a setback in order to play Sunday. His first chance to practice this week arrives Wednesday, but Friday's injury report will provide the final word on his availability. McDonald (ankle) has been ruled out for Sunday's game against the Packers, the Pittsburgh Tribune-Review reports. Analysis: With McDonald set miss his second consecutive game, Jesse James -- who hauled in five of his eight targets for 21 yards and a TD in Week 11 -- is once again in line for plenty of snaps in the Pittsburgh offense Sunday. McDonald (ankle) didn't practice Wednesday. Analysis: It's not the greatest sign that McDonald isn't able to practice yet after missing the Week 11 win over the Titans, but he does have a couple more days to return to the practice field in advance of Sunday's game against the Packers. In McDonald's absence in Week 11, fellow tight end Jesse James hauled in five of his eight targets for 21 yards and a touchdown. McDonald (ankle) is inactive for Thursday's game against the Titans. 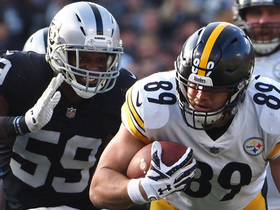 Analysis: With McDonald out, Jesse James and Xavier Grimble are slated to head the Steelers' tight end corps Thursday night, though neither if the two represent particularly high-percentage fantasy plays in Week 11. McDonald (ankle) is listed as questionable for Thursday night's game against the Titans. McDonald (ankle) didn't practice Tuesday. Analysis: On the Steelers' estimated injury report Monday, McDonald was listed in a limited capacity, so Tuesday's absence is a bit curious. If he wasn't held out in order to focus on rehab, he may have suffered a setback of some type since Sunday's win at Indianapolis. Pittsburgh's last report of the week Wednesday should provide some insight into his potential to suit up Thursday against the Titans. Monday's injury report notes that if the Steelers had practiced, McDonald (ankle) would have been a limited participant. Analysis: McDonald's status will thus need to be tracked as Thursday night's game against the Titans approaches. While seeing action on 30 of the Steelers' 66 snaps on offense in Sunday's 20-17 overtime win over the Colts, McDonald caught both of his targets for 16 yards and a TD. McDonald caught two passes for 16 yards and a touchdown in Pittsburgh's a 20-17 come-from-behind win at Indianapolis Sunday. 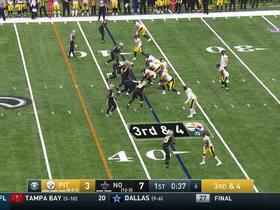 Analysis: Following a Ryan Shazier interception at the Colts 10-yard line, Ben Roethlisberger found a wide-open McDonald for a 7-yard score, his first as a Steeler. With just five receptions this season, fantasy owners should look elsewhere in Week 11, as the Steelers host a Titans defense that has held opposing tight ends to just two touchdowns in nine games. McDonald is questionable to return after suffering a right ankle injury against the Colts on Sunday. Analysis: McDonald has served as the solid No. 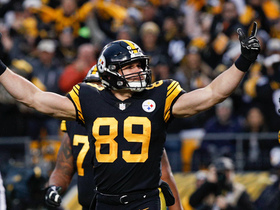 2 tight end for the Steelers, but he's hauled in just three receptions this season for 63 yards and zero touchdowns. It's tough to see much of an upside for him either, since the fifth-year pro has only been targeted in the red zone once in 2017. Expect Xavier Grimble to see an increase in snaps during McDonald's absence. McDonald (knee) isn't listed on the Steelers' Week 10 injury report. Analysis: The team's Week 9 bye obviously helped McDonald heal up, so he's on track to suit up Sunday against the Colts. His looming return bolsters the team's depth at tight end, but with starter Jesse James at full strength, McDonald remains a speculative fantasy lineup option. 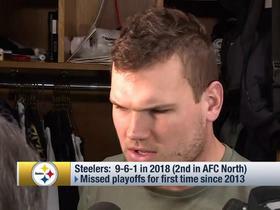 Pittsburgh Steelers tight end Vance McDonald talks about team chemistry inside the Steelers' locker room. Pittsburgh Steelers quarterback Ben Roethlisberger finds his tight end Vance McDonald deep for 49 yards. Pittsburgh Steelers quarterback Ben Roethlisberger finds his tight end Vance McDonald for a 5-yard touchdown. Pittsburgh Steelers quarterback Ben Roethlisberger finds tight end Vance McDonald for an 11-yard touchdown. NFL Network's Kyle Brandt dedicates footage of former Dallas Cowboys quarterback Troy Aikman getting sacked to the dad of Pittsburgh Steelers tight end Vance McDonald.